There are plenty of reasons to buy cases of bottled water. You might be traveling, camping, or just know you won’t have access to a reliable source of water. Another popular reason to buy bottled water is that it is convenient. Some households even replace their entire water intake with bottled water. Have you ever thought about the true cost of buying bottled water? Buying bottled water can be incredibly expensive, even when you just look at the cost of buying generic brand bottled water. We understand that for some communities, bottled water is the only option for getting safe, reliable drinking water; however, for certain families, it might be a better financial decision to get a water filter for their home. At Home Water Solutions, we serve communities across Northern Colorado and Idaho. We strive to bring homes clean, pure, and reliable access to water, regardless of what their municipal water supply is like. We offer many different water filtration systems that can soften your water and filter out all impurities through our reverse osmosis filtration system. If you are ready to experience high-quality water without having to pay for bottled water whenever you are thirsty, be sure to contact Home Water Solutions in Northern Colorado or Idaho today. If you visit our website, make sure to ask for a free water quality test today, and we will send out one of our water quality technicians! In the United States alone, the per capita consumption of bottled water has been steadily increasing since 1999. In 2017, the United States consumer 42.1 gallons of bottled water per capita. Our consumption of bottled water shows no signs of slowing down, even though the cost of materials continues to steadily rise. According to the American Water Works Association, tap water costs roughly $0.004 a gallon. This price is incredibly affordable for most Americans, as long as they can also filter the water or the water comes from a reputable water treatment facility. In comparison, bottled water costs about $1.22 per gallon as of 2012. Comparing those two numbers, bottled water costs almost 300 times more than tap water. Every day, people buy bottled water over using tap water for purely aesthetic reasons. Whether you don’t like the responsibility of carrying a reusable bottle or you don’t like the taste of your home’s tap water, understanding the true price of bottled water is a great way to get you motivated to save money. Not to mention, the environmental toll bottled water takes on the environment should not be ignored. After understanding the true cost of bottled water in the United States, it is time to critically think of ways to save both your wallet and your environment. We understand that bottled water has a time and a place where its value is certainly worth what consumers pay for. However, we also want to help people save money as much as possible. One of the easiest ways to start drinking your tap water is to use a simple carbon filter for your water. If you don’t drink your tap water for aesthetic reasons like taste and smell, this will be able to remedy the situation. Do not use a carbon filter if you don’t drink your tap water because of contaminants — carbon filters will not effectively filter out contaminants that are harmful to you. If you are looking for a long-lasting solution that will ensure your water is safe and tasty as well, be sure to look into a whole house water filter that utilizes a reverse osmosis water filtration system. Reverse osmosis is incredibly effective at removing contaminants from your water, giving you the confidence to drink it day in and day out. Some water filters also include a water softening system that will improve the taste and mineral content of your water. Because hard water is linked to skin irritation, hair deterioration, and plumbing problems, using a whole house water filter with a water softening system could save you plenty of money down the road. At the end of the day, bottled water is incredibly expensive. While there are definite advantages to using bottled water for traveling and being mobile, the consumer of bottled water pays dearly if they use it to completely replace tap water. At almost 300 times less expensive than bottled water, tap water should be used primarily. 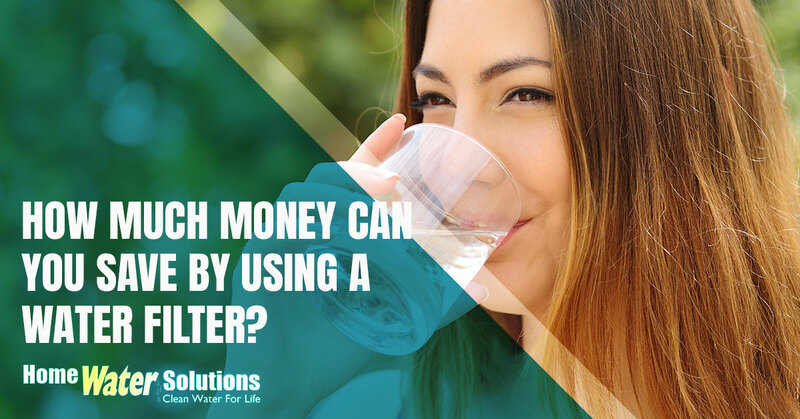 While purchasing and installing a water filter for your home may have a high fixed-cost, it will save you money for years to come. If you are ready to save money and secure safe drinking water that will benefit your wallet and the environment, be sure to contact Home Water Solutions in Northern Colorado and Idaho. When you visit our website, be sure to ask about a free water quality test today!